First I want to start off by letting you all know that MuscleHacker Brandi McAtee took 1st place at the Washington Ironman on Sep 24th 2011! See the interview I did with Brandi recently to discover how she trains and eats, the challenges she’s had to overcome, and how her results really took off after finding MuscleHack. After her first cycle of TSPA she placed 2nd in a competition, which was the first time she’d ever beaten anyone. She had only bought the program 4 weeks out from the competition! On only her second time using TSPA, she places first! Well done, Brandi! Ok, now for some new on the merchandise front. I posted up a new MuscleHack logo on Facebook recently. Since it was so well received and there was a demand for new merchandise, I’ve created some new products in my Spreadshirt shop. There are 2 stores, the North America store, and the UK/Europe shop. 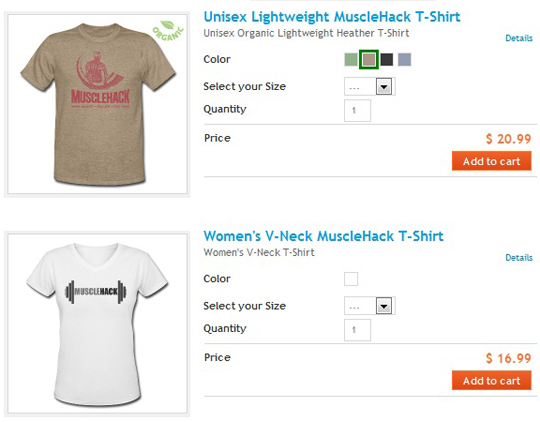 For some reason Spreadshirt have different products on each site, so you’ll find some different products on each one. This is beyond my control unfortunately. NOTE: You can change colors, sizes, and learn more about the type of material used by clicking the ‘details’ link at the top-right of each product. Here’s the new stuff! First the American Store. 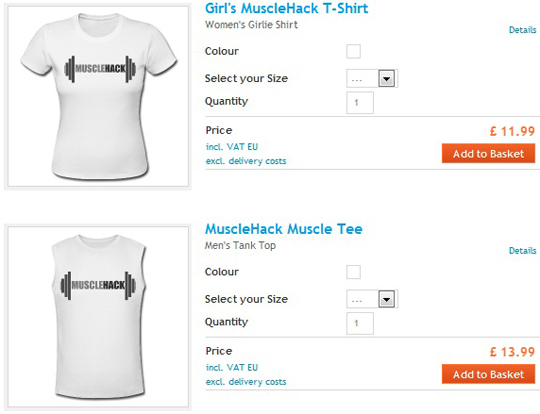 Now the UK/Europe store, where there are more products available including a SlimFit top, a cup, and even underwear! 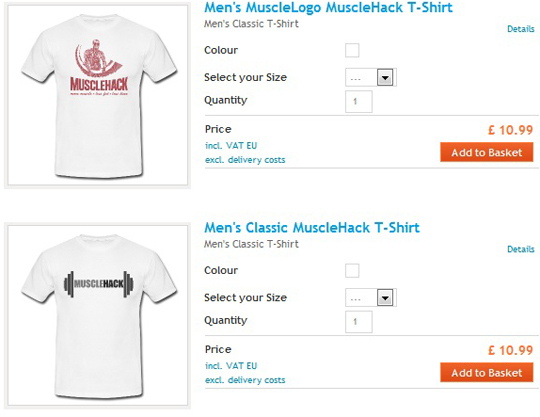 You can also buy MuscleHack merch straight from the Facebook group. Look to the left for the tab called Spreadshirt Shop. P.S. At MuscleHacker.com, Leigh just posted, “Healthy Eating: Cooking Is Overrated“. Very cool, Mark. 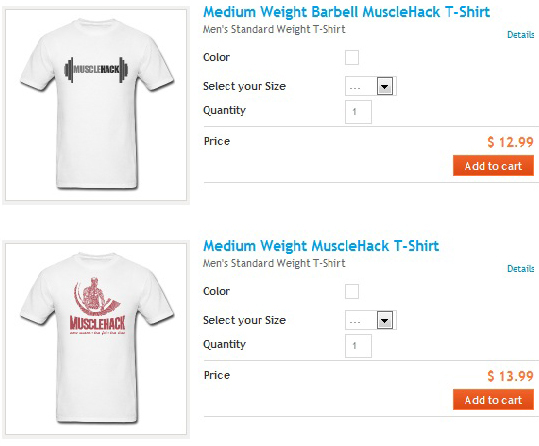 I remember back in the days of “Total Anabolism”, the idea of having a MuscleHack shirt to represent! Way to go Brandi! She lives very close to where I live too, so it’s good to see your reach is far and wide, Mark! Thanks Mark and Sammy! I’m gonna have to get me one of those v-neck shirts soon! Also, FYI, my local newspaper is doing an article on my competition and how I got there. 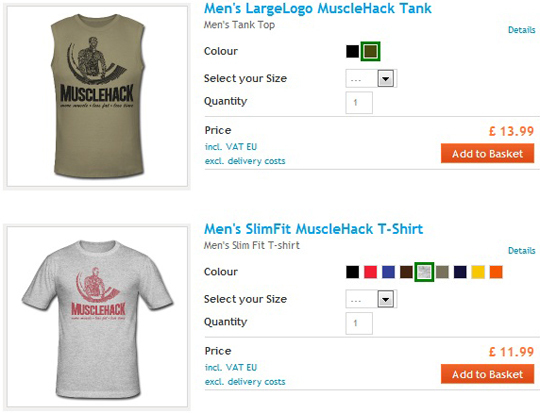 Expect Musclehack to be flooded soon…I gave TONS of info about your site and how it’s changed my life. Thanks again! I hope you blog about the contest, the pics, the prep and anything else on it. Cool merchandise designs! Any plans for singlets? @Brandi. Cool! Let us know if the article appears online so we can all see it! Hopefully it’ll recruit some new Hackers too 🙂 Thanks for spreading the word, Brandi. @Raymond. Thanks. I had a quick look there; Spreadshirt don’t do them. They do dog bandannas and ties, though! Awesome work, Brandi!! That’s great news! Mark, my question is…. is it ever necessary to go beyond failure in any sets like doing rest-pause (or drop sets), or is it enough taking the set to complete and utter failure and then stopping there before going on to the next set in 3 min? @Andrew. I do recommend some techniques beyond positive failure for experienced trainees. They’re not necessary for most people that are well below their genetic potential, but can certainly be used later on. Rest-Pause is just one technique, there are others as well similar to what I teach in the Arms Blast Experiment book. All the best!